There is slight haze edge of the middle lens. (But it does not affect the photos.). This lens doesn't have any defect which affects images. Including Front Lens Cap. Manual (In English). I will provide courteous and responsive service. Canon EF 75-300mm f/4-5.6 III. Maximum Magnification (X) 0.25 (at 300mm). The difference is that it uses a DC motor instead of a USM to drive the AF. Angle of View (diagonal) 32° 11' - 8° 15. DC autofocus motor. Top Value Super Lens! Amazing Deal! Fast Free Shipping! (The macro function is great at 300mm for butterfly and other scared subjects :) and at 300 mm has enough reach for bird shots. But I've switched systems, and this is the last of my Canon lenses. It will work on any Canon EF or EF-S DSLR body. Canon EF 70-210mm f/3.5-4.5 USM Lens w/Filter. Aperture blades work smoothly. ◆Optical system◆. Body has no scratches. It works properly. EFS Macro. 85m/2.8 ft. Canon EF-S 55-250mm 1:4-5.6 IS STM Zoom Lens. Lens has smooth function, but has not been film tested – see photos. You're purchasing a Canon 70-300mm f/4-5.6 Lens. Lens body: Very good. Clean with only light wear from usage. It's normally faster, but lets play it on the safe side! It is against the law. Rear glass: Excellent. The lens is said to have L lens level image quality. Hood very useful for lens protection and high quality image. Front and read cap. There are tiny dust inside the lens,but it does not affect the photos. This lens is Clean. ◆Lens&Optical system. There is no fog on inside of the lens. You can enjoy taking photos with the lens in good condition. 100% Guranteed! I will look for it for you. It looks great for its age. With a few slight marks/scars and rubs from normal use. I will provide courteous and responsive service from Kyoto, its the oldest city in Japan. EF 28-70mm f/2.8 L USM. • Lens Hood. Appearance of the item. • Front cap. • Rear cap. • Soft Case. I will find any item for you. The pictures are the actual item. Canon EF 28-105mm f/3.5-4.5 II EF USM Lens. Canon genuine front and rear cap. This lens is good. ◆Lens&Optical system. There is so tiny dust inside the lens, but of course it does not affect the photos. Canon EF 28-105mm F/3.5-4.5 USM Zoom AF Lens From Japan [Exc ] #412988A. There is no haze on inside of the lens. Including Front Lens Cap. Rear Lens Cap. I will provide courteous and responsive service. 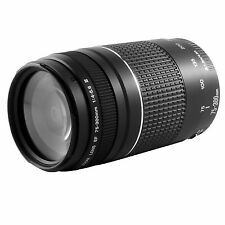 Canon EF 28-105mm f3.5-4.5 II USM Lens-Guaranteed+Free Shipping! Up for your consideration is an excellent example of the popular Canon EF 28-105mm f3.5-4.5 II USM Lens! The exteriorshows no real signs of use. At the maximum magnification ratio of 1:2 as objects of a size of approx. 5x7cm can be, depicted full format which allows for taking pictures of flowers, insects and the like. AF 70-300mm F/4 -5.6 di LD MACRO 1:2. This is the second version (the original Mk II, though not marked as such), the first with a 7 blade diaphragm (upgraded from the 5 blade version). The is moderate wear to to the rubber focus ring, but little other evidence of use. Contribute to worldwide photography ! FREE Trial! This is the Japanese version. The item carries 1 year limited warranty that is only in Japan. Contribute to worldwide photography ! / Φ80 x 145.5mm, approx. 710g Specifications subject to change without notice. This is the Japanese version. The item carries 1 year limited warranty that is only in Japan. Used(Exc condition). Exc Excellent Condition. Exc Excellent Condition. Exc Excellent Condition. Exc- Excellent- Condition. -Made in Japan. We will look it for you. -no balsam separation. Type: TelephotoBrand: CanonSeries: Canon "L"
Sigma 120-300mm f/2.8 DG OS HSM Sports Lens. Sigma 150-600mm f/5-6.3 DG OS HSM Sports Lens. Sigma 150-600mm f/5-6.3 DG OS HSM Contemporary Lens. Mount Canon EF. (ex Russia). This item is intended for the Japan market. 100% Money Back: non-opened (original condition). We do our best for you!! Canon EF 70-300mm F4-5.6 IS USM Lens. · Lens filter mounting part - Scratch / No problem with filter installation ( See Photo ). · Lens glass and mount is good - No Fungus, Haze, Scratch. · Include Front and Rear Cap, Hoya HMC UV Filter. Canon EF 70-300MM 1:4-5.6 ZOOM Lens USM. • Zoom system: Rotating type. • Diagonal angle of view: 32 (at 11 feet) to 8 degrees (at 15 feet). No APO,FPO. • Easy to use; ideal for a wide variety of applications. • Maximum aperture: 1:4-5.6. Sigma f4-5.6 DC HSM. EF70-200 f2.8 IS IIUSM. Battery grip. Excellent . Excellent . Apperance is beautiful. There is no haze. There is no fungus. Canon EF 28-70mm F2.8 L USM Lens. EW-83B Hood. · Lens hood re-painting. ( See Photo ). · Include Front and Rear Cap, EW-83B Hood. · Lens glass and mount is good - No Fungus, Haze, Scratch. · Helicoid and aperture ring smooth. Compatible with Select Sigma Lenses. Sigma 120-300mm f/2.8 DG OS HSM Sports Lens. Sigma 150-600mm f/5-6.3 DG OS HSM Sports Lens. Sigma 150-600mm f/5-6.3 DG OS HSM Contemporary Lens. Soft Carrying Case. Sigma 18-250mm f/3.5-6.3 OS HSM DC Lens. 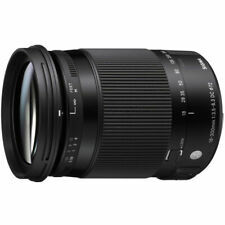 You're purchasing a Sigma 18-250mm f/3.5-6.3 Lens. Included accessories: Vivitar front cap and Canon rear cap. Lens body: Fair. It's normally faster, but lets play it on the safe side! USM engines are particularly powerful, turning and braking lightning fast, precise and quiet. You can expect a fully-functional unit. CANON LENS. KODAK LENS. SAMSUNG LENS. NIKON LENS. CASIO LENS. Accessories IncludedFront Lens Cap. Rear Lens Cap. It has been tested with a canon. The lens is in excellent condition with light wear. CANON ZOOM LENS EF 75-300MM 1:4-5.6 III USM. LENS: CANON MODEL CANON ZOOM LENS EF 75-300MM 1:4-5.6 III. Lens Type Zoom Lens. After several years in that Cedar Hill location, we outgrew our space and needed a larger building.